Hi All, my name is Christopher Scott. I have had a deep interest in Oak Island all my life first visiting the island as a toddler. My family helped to establish Nova Scotia way back in the day after immigrating from the border area of Scotland (where my surname comes from) to the Glace Bay area. I was however born in Indiana and every year my Father took my family to Nova Scotia while I grew up. Oak Island was always my favorite part of the trip. Oak Island is the best place on earth to learn how to skip rocks. The island is full of smooth round stones perfect for skipping. My Father told me of the treasure legend when I was very young and since then I have been fascinated with it having read as many books as I can about it always looking for a clue that will allow me to solve the puzzle. lol. After High School I moved from Indiana to Nova Scotia, went to Dalhousie and often toured the areas surrounding Oak Island. In the 90's I could no longer get over to the island as the causeway had a gate and notice that nobody was allowed over. I was saddened by this as I wanted to stroll around and pick and pry at things, teach some younglings how to skip rocks and more. I am in BC now but always find time to visit Nova Scotia and when I do I always head straight for Oak Island. I feel it is my destiny somehow to be involved in the hunt. If I ever have enough money I will buy the island. Anyway, nice site you have here. One thing I noticed that is missing is illustrations of the money pit. In books I have seen illustrations describing what was found at each level etc. that were fascinating. Cheers all! Now I am headed to the theory section. "You always pass failure on the way to success. " Nice to meet you. It's always nice to hear from people who spent a part of their childhood visiting Oak Island. I can see why t captured your imagination. I first heard about Oak Island as a child and I'm sure if I'd been able to toyur the island, I'd not have wanted to leave (I live in London, England). I hope you enjoy perusing the theories and ideas people have shared here and please don't be afraid to ask any questions, and we'll do our best to help. Do you recall ever seeing any treasure hunting taking place during these visits? I remember seeing massive tractors and I believe cranes on the island when I was young and my Dad told me that these were tools used by the current group trying to get to the treasure. I was even more amazed when he told me that Roosevelt himself had come to the island in the past looking for the treasure. 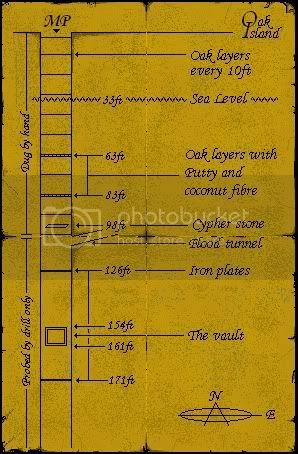 You mentioned a diagram that shows all the different levels of the Money Pit, was you looking for something like this? That's pretty cool - it's certainly something many of us hope to see very soon if the Michigan Group can make their way through all of the red tape they've been held up with. Along with Roosevelt, there have also been other celebrity figures who have expressed an interest at one point or another, such as John Wayne and, if I'm not mistaken, even Errol Flynn...although FDR probably trumps them all.